Arthur St. John, 94, has worked at Market Basket for 22 years as a part-time employee — but his future is uncertain after his hours were cut by corporate amid the still-unfurling drama between the supermarket chain's employees and management. "I'm out for a while until they've settled the strike," St. John said. 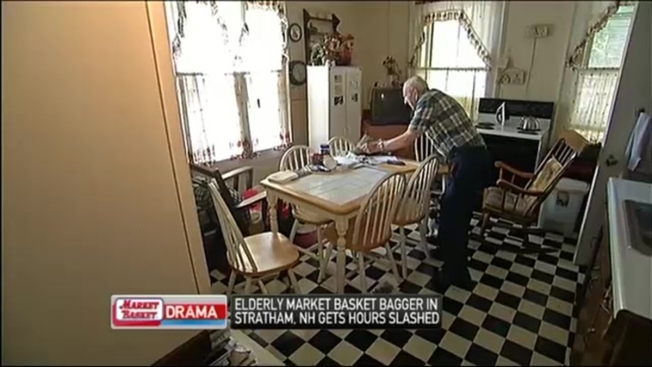 St. John worked at the Stratham, New Hampshire, location but has been home since his hours were chopped. Barbara South, another Market Basket employee, calls St. John amazing. "He gave many hugs, and many customers would see him walking his two dogs," she said. St. John works three four-hour shifts each week to supplement his Social Security checks. "I get $125 a week, and everything is taken out. What can you do?" he said. Although he's out of work, St. John says he's thinking beyond himself and worrying about his coworkers who have to support their families. "They've got kids, and wife and kids, and out of work. How are they going to support their family? I don't feel right for that," he said. St. John's attitude about this being more than just a paycheck is the reason behind his coworkers' respect for him. "This is a man who comes in here — this is his social life, you know, we are his family," South said. And while it is family drama within the Demoulas clan that sparked the protests, the push for ousted Arthur T. to return to his post as CEO has remained. "I want him back, because everything was running good then," St. John said. Workers all say Demoulas was a great boss who helped make Market Basket a great place to work, offering employees profit sharing, good wages and benefits. They feel he's an irreplaceable leader and refuse to work for anyone else. Demoulas was pushed out of the company by his cousin's allies in June. Until then, St. John says he'll "sweat it out." A GoFundMe page was created Thursday to raise $5,000 for St. John.